Donald Grasse, a graduate student beginning studies in political science at Emory, was one of the first to try out a study booth in the new Learning Commons on Level 1 of the Woodruff Library. Photo courtesy Woodruff Library. These study pods, similar to the ones students will see on the renovated Level 1 in Emory's Woodruff Library, provide a place to concentrate on a largely collaborative floor. Photo courtesy Steelcase. 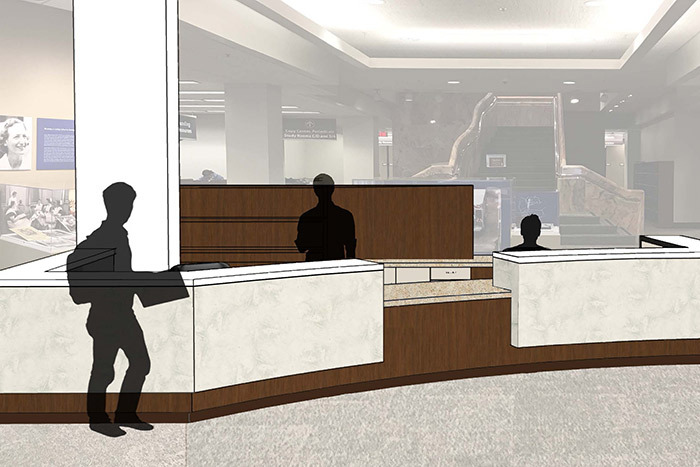 This rendering shows what the new service desk will look like at Woodruff Health Sciences Center Library. Image courtesy Collins, Cooper and Carusi. The renovated Learning Commons has opened on Level 1 of Emory’s Woodruff Library, with movable seating, study pods and plenty of power outlets. Places for both individual study and collaborative work are woven throughout the inviting design. 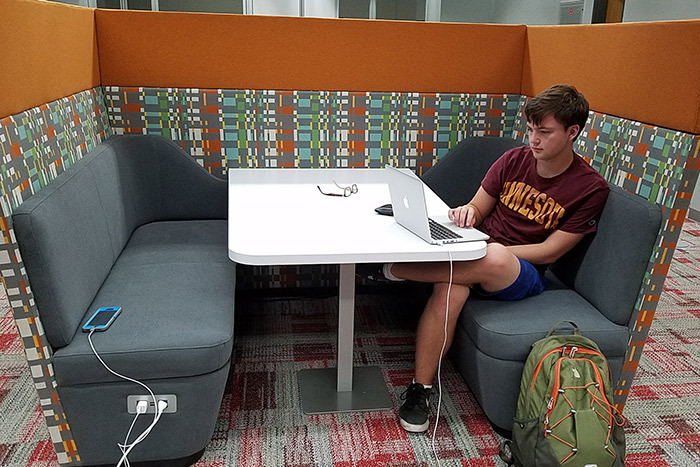 The library added tables for group work, individual study pods, booth seating and other options, expanding the space dedicated to student work to more than 20,000 square feet. A variety of more comfortable seating has been added, and much of the furniture can be easily rearranged for collaborative work. Elevated booth-style seating, similar to the popular seating area on Level 2, lines the wall outside of the coffee shop. Both movable and fixed whiteboards are scattered throughout the space. The number of power outlets has nearly tripled with the renovation and they are conveniently located, so students and other patrons can easily use and keep their portable devices charged. Some of the microform cabinets and readers remain on Level 1, but most microforms were relocated to the Library Service Center to make room for the new space. Patrons can request those microforms, which will be delivered to the Emory library of their choice. Peet’s Coffee & Tea, the group study rooms, Student Technology Support (STS) and the meditation room remain on Level 1. Group study rooms will now feature new collaborative technology supporting wireless, multi-user, multi-platform (Mac, Windows, iOS, Android) connectivity to the room displays. Woodruff Health Sciences Center Library also saw renovations this summer with a new service desk and lobby at the plaza entrance. Sandra Franklin, director of the Woodruff Health Sciences Center Library, says the revitalized entryway on the ground level has been redesigned to provide better functionality and a welcoming first impression that connects the user with information services staff. Improvements include a small lobby with chairs, an accessible turnstile entrance, a service desk with functional shelving for reserve readings, a consultation station and better environmental conditions around the sliding doors for energy efficiency.